FTVLive told you that this was the time of year that you would see a lot of News Director turnover and as predicted, it’s happening. 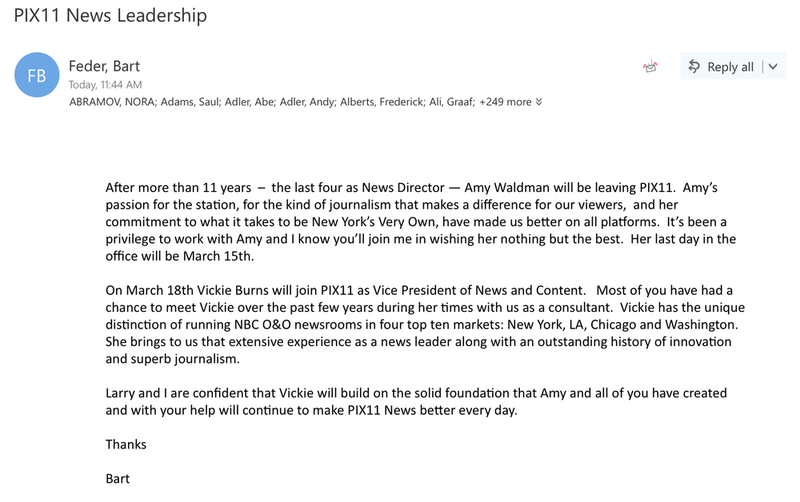 In NYC, WPIX News Director Amy Waldman is out the door and her replacement has named. FTVLive FIRST told you back in 2015 that Waldman was going to get the ND chair at the station. Waldman is officially gone next week and Vickie Burns, who has been consulting the station takes over as News Directors. It is interesting how many times a consultant swoops in and takes the ND’s job away from them. This should be a lesson to all News Directors, never trust your consultant.